BRYAN WHITMAN (deputy assistant secretary of Defense for Public Affairs): Well, good afternoon. And thank you for joining us this afternoon for a briefing on the acquisition strategy for a replacement aerial refueling tanker. It is my privilege to be able to introduce to you three key individuals that are instrumental in charting the way ahead for the tanker replacement. Most of you know these individuals, but let me introduce Deputy Secretary of Defense Bill Lynn, Air Force Secretary Mike Donley, and Undersecretary of Defense for Acquisition, Technology and Logistics Ashton Carter. They have for you a rather comprehensive briefing. It will take 15, 20 minutes or so to go through that. We ask that you hold your questions. They will take your questions when they're finished. And as you leave the room today, we'll also make sure that you have a copy of all the presentation materials that they'll be showing up here on the screen. So with that, gentlemen, thank you for coming to the briefing room to go over this very important topic and to chart the way forward for the department. MR. LYNN: Thanks very much, Bryan. And hello, everyone. If we get a little punchy on this, this is, I think, the sixth time we've done this. We've been up on the Hill giving this briefing, but we want to give it to you all as well so -- make sure the public understands where we're going on the acquisition strategy for the refueling tanker to replace the KC-135 and the DC-10 fleet. What I'm going to do is I'm just going to take a couple of minutes and give you the overall picture. And then Secretary Mike Donley is going to describe the warfighting requirements and the Air Force selection process. 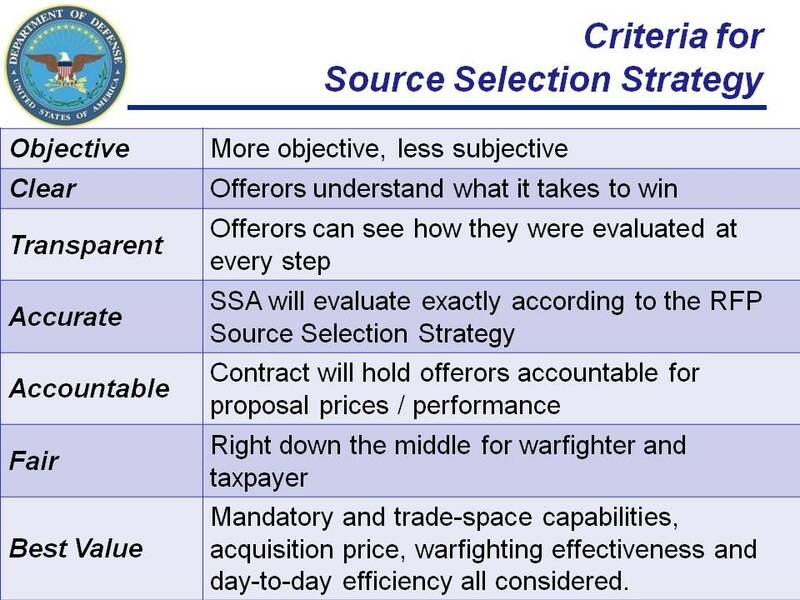 And then, Undersecretary Carter is going to describe the source-selection strategy itself. Where we're starting is from last April, when the -- Secretary Gates announced that we were going to undertake a new effort to construct a competition to replace our tanking fleet. He pledged at that time that this competition was going to be fair and transparent, it was going to be as open as we could make it. And we've endeavored to do that. And let me just take a couple of minutes and outline the approach that we've taken and make three or four points. The first point is that the Air Force will be the source selection authority. 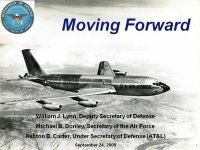 This was announced last week at the Air Force Association by Secretary Gates. It reflects his confidence in the Air Force to execute this important program. It reflects the strong recommendations of both Undersecretary Carter and I that the Air Force be put back in the driver's seat on this position. It, however, does not reflect a total handing over of things to the Air Force. This is -- will be a collaborative process. It has been to this point. The Office of the Secretary of Defense, Ash and I and our teams, have been working very closely in designing the strategy that's behind this source selection. 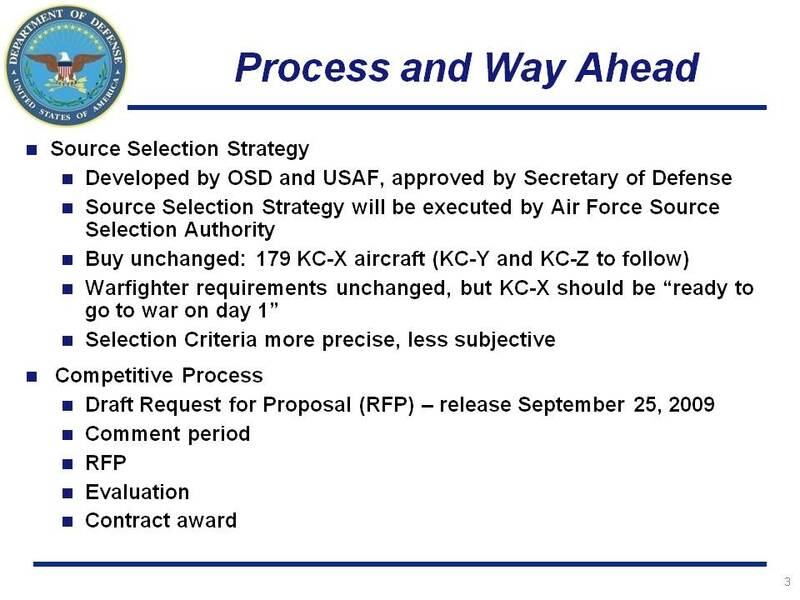 When we get to the actual execution phase, the evaluation phase, there will be, as Secretary Donley will describe, some independent review panels: both an internal Air Force panel, an OSD-led panel on process and a(n) engineering panel that will include talent from not just the Air Force and OSD but other services, particularly the Navy. That's the first point. Second point is, this is not a rerun of the prior process or the prior RFP. GAO found substantial flaws in that process -- indeed, so substantial that they overturned the award. We're very cognizant of the criticisms they've made, and we've taken strong steps to try and address those criticisms. 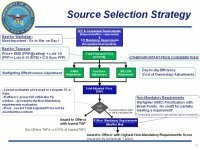 Secretary Carter'll -- Carter will describe the source-selection process in detail, but suffice it to say we are trying to be very explicit about the criteria that we're going to use, explicit about the scoring system we're going to use and explicit about the decision tree that will be used to make this selection. The third point is that this is a best-value competition. There's been some talk that this might be a price shootout. That is not what we're proposing here. Price is extremely important in this competition, but it will not be the only factor. We will look at -- first of all, we'll look at price from a broad perspective, not just acquisition cost. But we're going to include certain aspects of life-cycle cost, in particular fuel burn and military construction; and we're going to look at non- price factors, particularly how each aircraft that the companies might bid would meet warfighting requirements. So this is a best-value competition that includes both price and non-price factors in a -- balanced in a way that Secretary Carter will describe. Fourth, this is a step forward for us in terms of acquisition reform. We're building on the legislation that Congress passed under the leadership of Senators Levin and McCain, as well as Congressman Skelton -- Chairman Skelton. First, it emphasizes competition. We think the structure of the competition we're putting forward today will result in a very strong competition. And that competition will lead to value for the taxpayers and a good result in terms of warfighting capability for our men and women in uniform. But more precisely in terms of acquisition reform is we're using a somewhat different contract structure than was used before. This will not be in the development phase a cost-plus contract as is most often the case. It will be a fixed-price incentive contract in the development. In the first five production lots it will be a firm fixed-price contract. And for the remaining production it will be what's called a not-to-exceed contract. This is going to constrain prices considerably, we believe. It's shifting the department from a cost-plus world more towards a fixed- price world, and we think that that's going to be an important element in avoiding cost overruns. So this is a commitment towards acquisition reform. The bottom line is, we tried to play this straight down the middle. We haven't favored anyone except for the taxpayers and the warfighters. We've taken every step that we can think of to make this a fair and open transparent competition pursuant to the direction we had from Secretary Gates. And with that, let me turn it to Secretary Donley to describe the Air Force selection process as well as the requirements. SEC. DONLEY: Okay. Thank you, sir. I'll be starting on slide 4, please. I just want to reiterate during this part of the brief the need for the Air Force and for the warfighter to get a new tanker. We have been at this for several years now, and we very much need to succeed going forward. 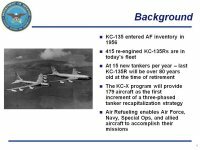 The KC-135 entered the Air Force in the mid- to late '50s. 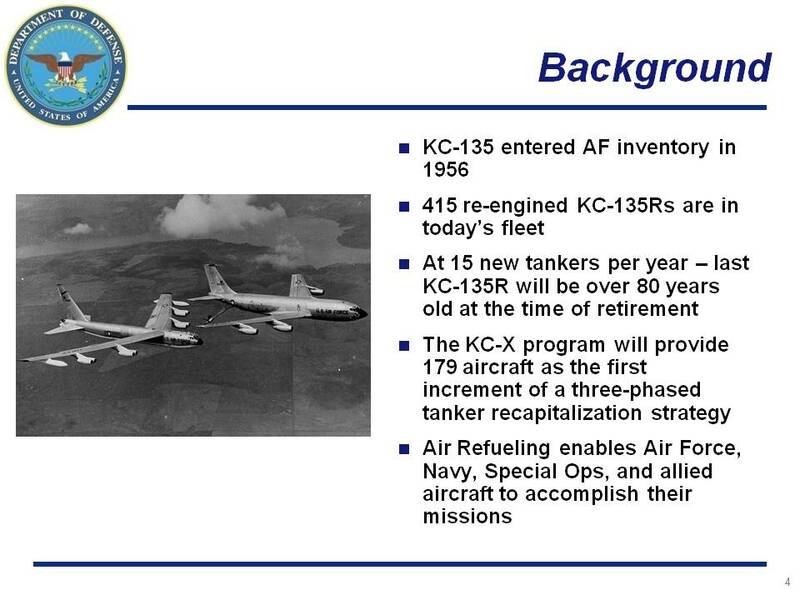 The youngest KC-135 was delivered in 1964. This will be a long-term process to recapitalize this fleet. 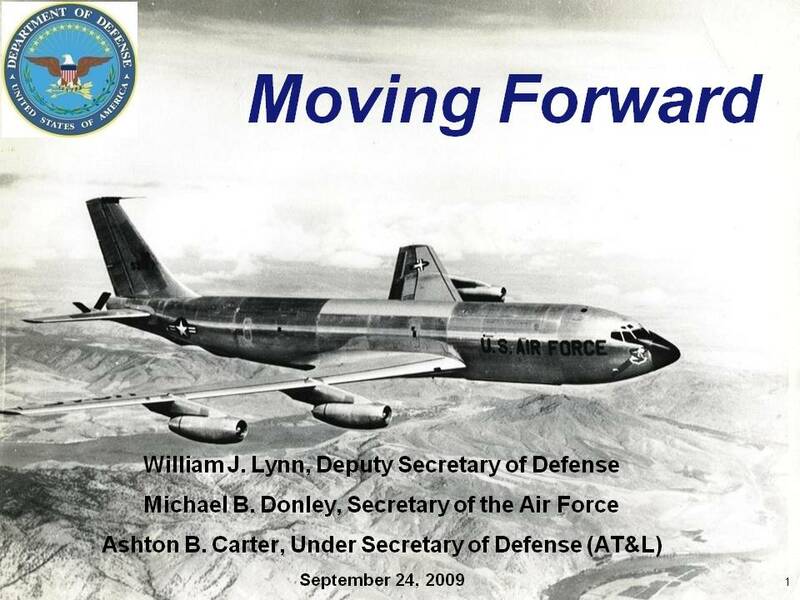 Potentially by the last time -- by the time the last KC-135 retires, it could be 80 years old. So we need to get on with this recapitalization. The KC-X program is structured as it had been for the last several years. We envisioned a three-phase process, KC-X, -Y and -Z to recapitalize the force. This is the first increment, represents about one-third of the tanking assets that we have. It's 179 aircraft. If successful, which we expect to be, the first production delivery would be planned for 2015, and IOC would occur in roughly 2017. This capability is not only vital for the Air Force, it's in vital -- it's vital for the joint and allied team as well. Aerial refueling underwrites the global reach of the United States armed forces. 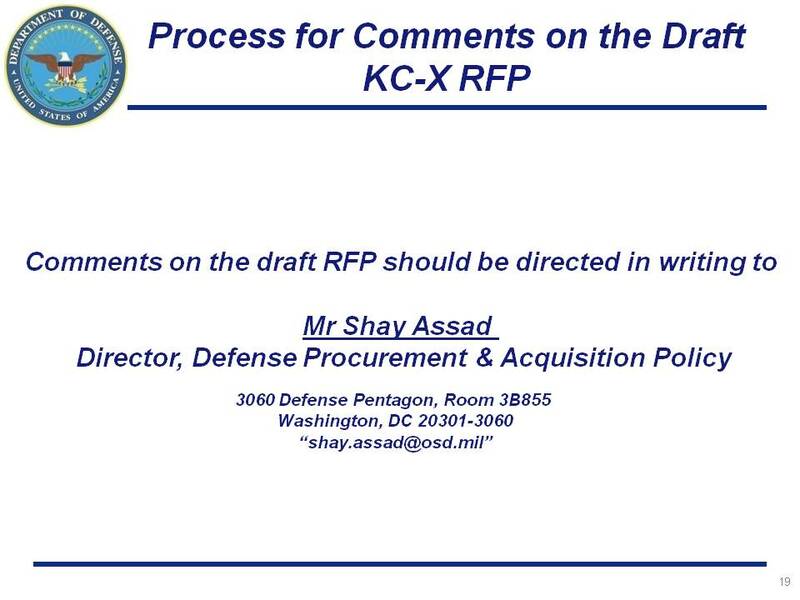 I want to talk specifically about the wartime requirements on which this RFP -- draft RFP is built. These requirements were developed by the Air Mobility Command, which is the operator of the aerial refueling fleet, and it reflects priorities that would expect for this mission -- the number of booms and drogues in the air, the aerial refueling capability itself, the range and off-load capability, the ability of the aircraft to self-deploy and provide other capabilities associated with the KC-135 fleet today. 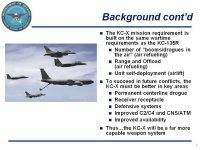 But to succeed going forward, we need some additional capabilities that we expect to gain through the KC-X procurement. 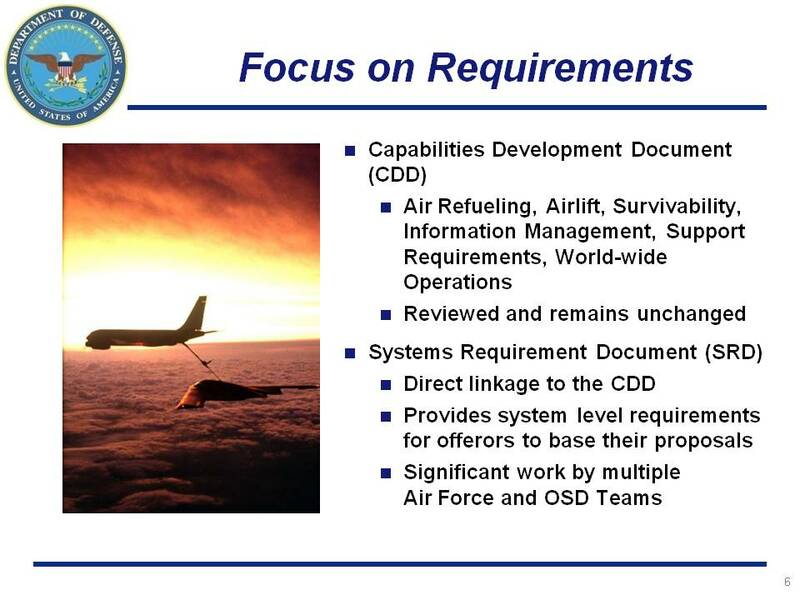 Some of the additional capabilities that are required are listed on this slide but include the kinds of upgrades that you would expect: communications and navigation systems; air traffic control; air traffic management systems that will be compatible with the next- generation air traffic control systems, so that these aircraft can deploy worldwide into those air traffic systems; defensive systems, both probe and drogue capabilities. We want the next tanker to have a receiver capability, not just to be able to offload fuel but be able to receive fuel as well. 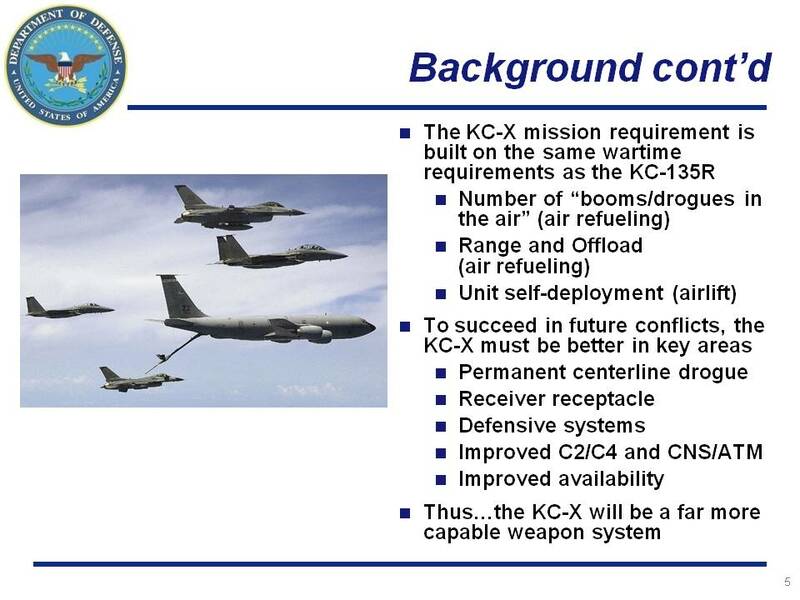 So we expect the KC-X to be far more capable than the KC-135 that it replaces. Slide, please. Let's focus on requirements for a minute. 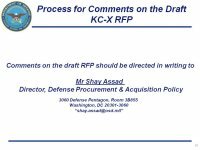 Just to give you a broad overview, the Capabilities Development Document is the very high-level overview of the requirements for the KC-X going forward. The CDD as it's referred to is the same CDD that was reviewed and approved in December of 2006. The Air Force revisited this early this year in January. The Joint Requirements Oversight Council also reviewed it in February. And no changes have been made. Again this is the very high-level, what are our requirements going forward for a KC-X aircraft? The key work that has been done is at the Systems Requirement Document, the SRD, level. 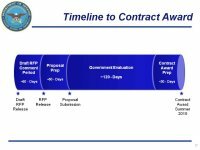 And here we undertook significant changes, without changing the requirements but to make a better linkage between the requirements written by the warfighter and the RFP that's going out tomorrow. The SRD is where the system-level requirements are defined in more detail. And they do form the basis for the RFP. A tremendous amount of work has been done. I'll describe that in a little bit more detail. But AMC led this work, but it has been a collaborative effort with the rest of the Air Force and OSD, as the secretary indicated. Slide, please. You may recall that in the last solicitation, there were about 808 requirements listed, for the KC-X, of which about 37 were mandatory requirements. And this provided an extensive amount of trade space in those requirements to determine how a selection and -- how an evaluation and then selection might be made. 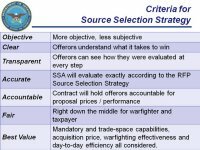 However, by doing so, the offers indicated last time some confusion, because they did not clearly understand what the warfighter valued most. Another factor was that the way the requirements were written and their distribution throughout the RFP also left some uncertainty and confusion. We've taken those 808 and we have boiled them down to the 373 mandatory, system-level requirements, which reflect what the warfighter needs on the first day of the war. When this aircraft is delivered, the warfighter will be able to take those capabilities and go to war. That's the fundamental baseline requirements that Air Mobility Command has put value on and which they need to make this a successful program. 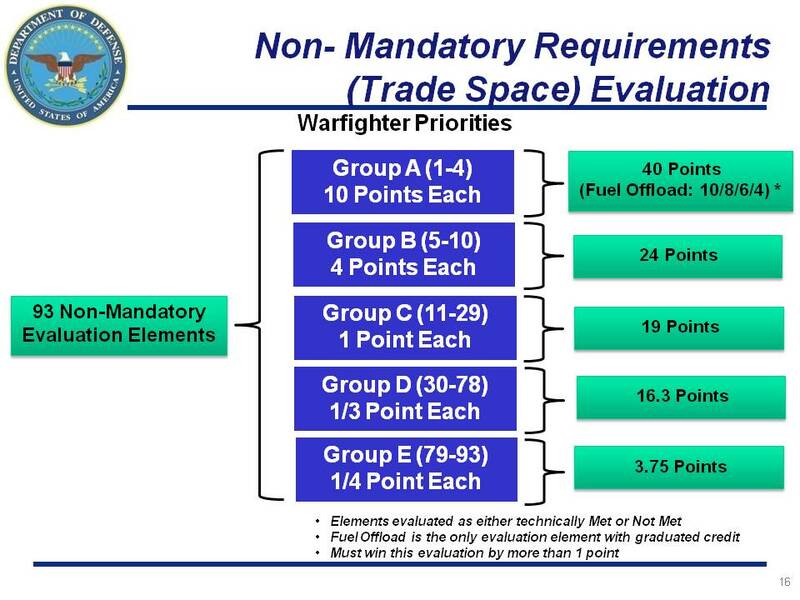 Above that, we have identified 93 trade-space requirements. 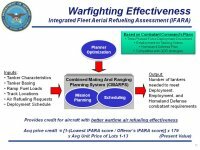 They are non-mandatory, above-threshold requirements that would provide additional capability to the warfighter, additional value, but not to such an extent that the warfighter would be willing to pay that much more for these capabilities. And Secretary Carter will explain a little bit later how this relationship between the mandatory and the non-mandatory, above-threshold requirements relate to each other. Our task here was to not only take out the duplication, to combine the requirements where we thought they could be combined, but to write them clearly and precisely. And these requirements will be evaluated in an acceptable/non-acceptable basis. Again, Secretary Carter will refer in more detail to how this is put together in the strategy. Couple of points on source selection, please. As the deputy indicated, the source-selection responsibility has moved to the Air Force. The source-selection authority will be a senior career Air Force official. And consistent with normal practice, we will not publicly identify this official or other individuals involved in the source-selection process. We do that to shield them from undue influence in the source-selection process. There are many, many new members to this effort. Most if not all of the key leadership positions in the source-selection process have changed since the last solicitation. The source-selection authority is responsible -- is a single individual that has overall responsibility for executing the strategy that Dr. Carter will speak to in a minute, but they are backed up by a source-selection advisory council, while the membership of that council is completely changed. This is the senior review team, if you will, that advises the source- selection authority. Supporting the advisory council is a series of 14 separate evaluation teams. These teams will take the proposals from the offerers, divide them up into these 14 areas. And they will do -- they will conduct the evaluation of the proposals and provide their results to the advisory council, who will then flow up their advice to the source-selection authority. In addition to this process, though, we will have independent review teams -- this process of providing an independent assessment, not of what the offerers sent in, but of how we evaluated the proposals. And how we conducted the process was not fully in place last year. But it is today, and is -- it is intended, at a policy level, to be a normal part of our business going forward. So while we do this evaluation, we will have an -- independent teams reviewing our work to make sure we have clearly connected the decision that is recommended to the source-selection authority all the way back through the evaluation process into the RFP and all the way up to the (requirement's/requirements') documents. It is our obligation to do this with precision and with discipline, to make sure we have documented every step in this process as we conduct this source selection. We are delighted to have this responsibility back. I believe the Air Force is ready for this responsibility. But I'll now turn it over to Dr. Carter, who will explain the source-selection strategy. MR. CARTER: Thank you. 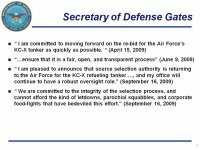 I will be describing the source- selection strategy, which we have devised, which the Secretary of Defense has approved and which will be the method that the source- selection authority uses to pick the winner in the tanker competition. It is described in about eight charts in the package that will be given to you after this briefing. It's a little complicated, a little bit of an eye chart here, but I'm going to walk you through it. But the essence of it is this: As the deputy said, we are this time going to try to be, and are being, very precise about what the offerers need to do to win. And it will be crystal clear, when a winner is picked, why they won and the other offer did not win. 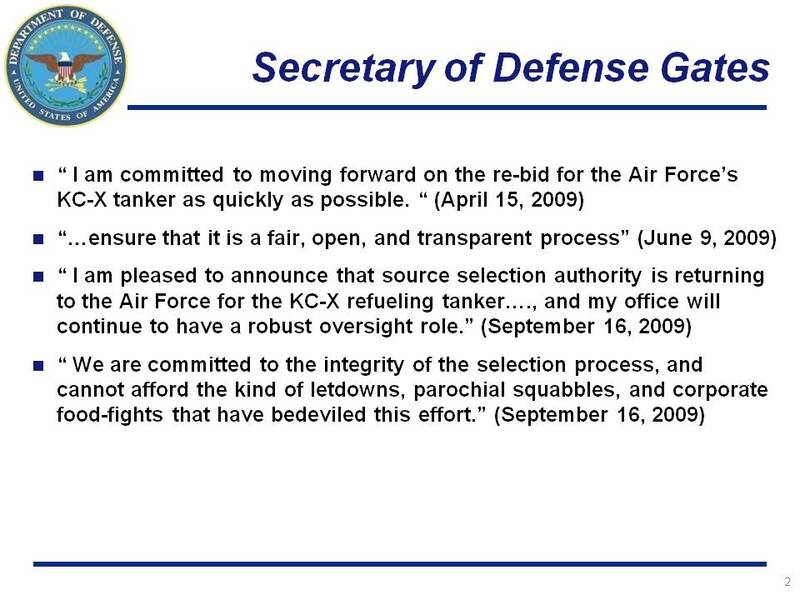 So much of the subjectivity which we in retrospect found, and which the GAO found, in the source-selection strategy last time the tanker was competed this strategy avoids. Let me start at the top. This is a decision tree, essentially. This is the decision tree that the source-selection authority will use to pick the winner. First, each offerer, starting from the top of the chart, will be required, as Secretary Donley said, to meet 373 mandatory requirements. This is what the warfighting customer says he needs to have an airplane that is ready to go to war on day one. They must meet all 373 of those requirements. It's a pass/fail test, acceptable or unacceptable. So also acceptable or unacceptable are certain contractual requirements, which are normal in solicitations of this kind. So that blue gate is a pass/fail test. We expect offerers to pass that test, but it is nevertheless a test. Then we will ask each of the offerers to give us a price. As Secretary Lynn says -- said, we will be applying our acquisition -- some of our acquisition-reform principles. As we asked for that price, we will be asking them for a fixed price for the engineering and manufacturing development phase, the EMD phase. That will be a fixed-price incentive contract with a ceiling, those of you who are aficionados of contract types. And it -- we are doing that even though this is a development phase, because this is a product that is well-defined. We've flown tanker aircraft based upon commercial drive, from commercial aircraft for many years. This is not the Manhattan Project, where you don't know exactly what's going to come out the other end. And so it's not only appropriate but useful and important for the taxpayer that this be done in a fixed-price environment. So also will the initial lots, lots 1 through 5, lots 6 through 13, on a not-to-exceed basis -- that is, with an upper limit -- and initial contractor support -- five years of initial contractor support, again with a fixed price. If this were a price shoot-out, the chart would end there, but it's not, as the secretary -- as Secretary Lynn indicated, a simple price shoot-out. So one needs to go further down the chart. We will, after the prices are proposed, adjust them to take into account some other aspects, non-price aspects, of what the offerers are offering that we deem important. And they are basically of two kinds. On the left are the warfighting effectiveness adjustments and on the right are the day-to- day efficiency or cost of ownership adjustments. Let me say something briefly about each one of these. And once again, there are charts on these subjects, and you can go into this in as much detail as you can stand and in your own time. 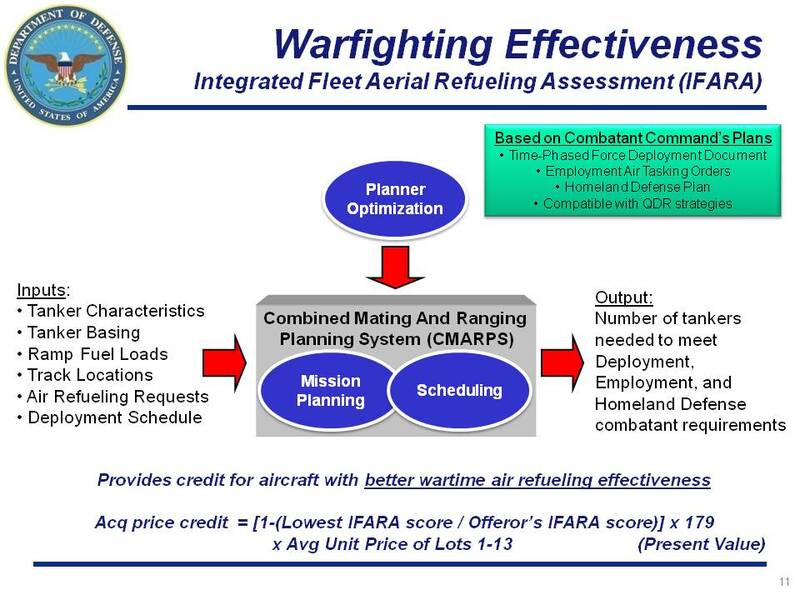 Warfighting effectiveness asks -- flies each of the offerer's aircraft against a model, which aficionados will recognize as IFARA, the Integrated Fleet Aerial Refueling Assessment model. IFARA says: Imagine the worst day of the 40-year lifetime of these airplanes, the worst day for the United States, a day in which we are executing several major war plans simultaneously, and therefore our tanker demand is at a peak. How many of each offerer's aircraft does it take to meet that demand? And the offerer who requires the lesser number of aircraft to meet that demand, we'll give some credit for the fact that their aircraft are more capable in that sense, for wartime purposes. Of course, we don't expect to be at war every day for the next 40 years. So there's another consideration we need to take into account, which is the cost of ownership, to the government, of having these aircraft on a day-to-day basis. That is on the right-hand side and has two parts: fuel-burn adjustment and MILCON. These are the elements, of the life-cycle cost of the tanker, that are under the control of the offerers and which therefore can fairly be used to discriminate the offerers. There are many elements to life-cycle cost of an aircraft. For example, the salary of the airmen, but the vendors don't determine that. The vendors do determine the aircraft design, which in turn determines how much fuel they will burn, over the next 40 years, carrying out the day-to-day tasks. And also the type of aircraft will determine what we in the government need to do -- in the way of military construction -- to adjust hangars, ramps, taxiways and runways and so forth differentially for the two aircraft. And that will be taken into account. So both wartime effectiveness and peacetime efficiency we will assess for each aircraft. We will dollarize those assessments and in dollar terms adjust the bid prices. That takes you down to the blue square in the middle called Total Adjusted Price. And now we come to the end. If those total adjusted prices differ by more than 1 percent, the lower of the two wins, end of story. If those two adjusted prices are close -- that is, within 1 percent -- then, and only then, will we consider the 93 nonmandatory requirements. Why is this? This is because the customer has decided that he really needs the 373 mandatory requirements. We definitely want to take into account the wartime and peacetime adjustments. But the customer attaches some value to the 93 nonmandatory requirements, but not much -- willing to pay a little bit more for a little bit more, but not more than 1 percent. If it does come to that, and the adjusted prices are close, and we turn to an assessment of the 93 nonmandatory requirements, this time we want to make it absolutely clear to the offerers which of those requirements is more important than the other and how much weight they should attach, as they prepare their bids, to those factors. If I can have the next chart, please? So we've left nothing to chance, or to guesswork, in that regard. Those 93 nonmandatory requirements, which constitute the trade space, each item of those 93 is assigned a number of points -- essentially, its worth to the customer, in his judgment. Again, this is the Air Mobility Command. And the two offerers will be evaluated according to how many points they score. And if one or the other offerer wins by more than one point, they win the competition. You might ask, what if it's so close that they don't win by one point? (Chuckles.) Probably, very unlikely event. But in that case, if it's a tie in the trade space, you go back to price, and whoever had the lower price, even if it was less than 1 percent, wins. So this -- I'm sorry to have gone through this in some detail, but there are two points about it. The first is that the offerers can, by looking at this chart, ascertain exactly how -- they know how to win. No doubt. And secondly, this can be reverse-engineered, so next summer, when a winner is named, everybody'll know why one side won and the other side lost. 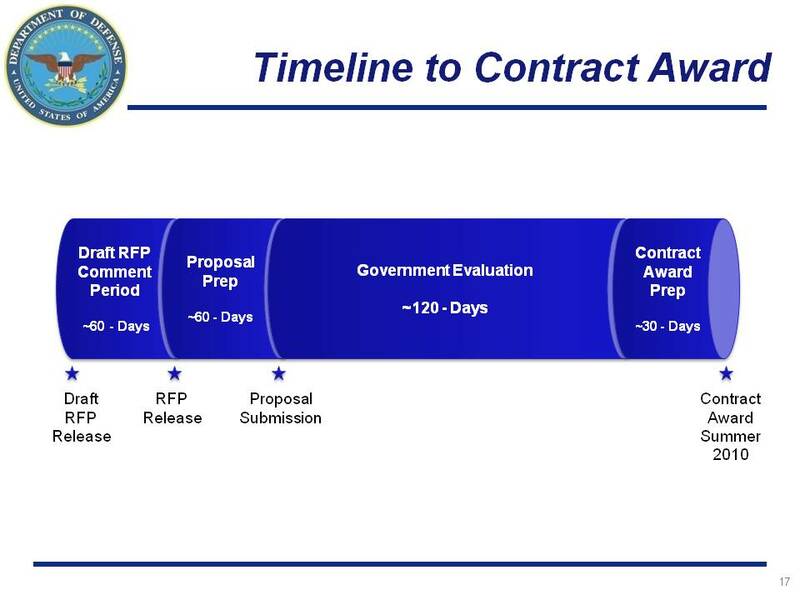 I mentioned last summer, this is the timeline to contract award. The draft RFP will be released tomorrow morning. The offerers will have 60 days to comment; members of Congress -- the secretary made it clear that members of Congress would also have the opportunity to comment and for us to review their comments. And after we have reviewed all of the comments, we will release the final RFP in about 60 days. About 60 days after that, the offerers will be required to submit their proposals. The government will then take up to 120 days to evaluate the proposals, looking to a contract award next summer, summer of 2010. It's worth mentioning that Northrop Grumman has suggested that information was disclosed about its previous tanker bid that puts it at a competitive disadvantage. DOD has examined this claim and found both that this disclosure was in accordance with regulation and, more importantly, that it created no competitive disadvantage because the data in question are inaccurate, outdated and not germane to this source-selection strategy. Next, we have been advised that the World Trade Organization recently issued a ruling in a U.S. versus European Union case alleging unfair subsidies to Airbus. We have been further advised that this is an interim ruling, that there is a counterclaim by the European Union regarding Boeing that has not been ruled on, and that final resolution of these cases is many years away. For these reasons, we are not able to take account of these claims in the RFP. We have, however, added a "hold harmless" clause to the draft RFP, meaning that any penalties assessed in final rulings would not be passed to the U.S. taxpayer. Let me close by summarizing the key features of this source selection. First, it is not a rerun of the last competition. That competition was criticized for being too subjective. This time as you have seen, we will be objective and crystal clear about how the winning offer will be selected. Additionally the warfighting customer has made precise and prioritized the mandatory and nonmandatory requirements. Second, this strategy weights both price and nonprice factors. Thus it is not a low-price, technically acceptable or LPTA approach. In acquisition parlance, it is a best-value competition, with both price and nonprice factors taken into account. But in the tanker context, some people use the term best value to mean a rerun of the last competition. And as Secretary Lynn noted, this is not a rerun. Third, by requiring fixed price offerings -- for EMD, procurement and initial contractor support -- this approach is in line with our acquisition reform priorities. Fourth, we've crafted this approach to favor no one except the warfighter and the taxpayer. We are certain that some would prefer that we not use IFARA or that we not count cost of ownership or that we weigh price more or less highly or one requirement more or less highly. But we've steered right down the middle. MR. LYNN: Open to you for questions. Q John Tirpak, Air Force Magazine. Gentlemen, the tanker has been in limbo for a long time. Why did you elect not to kind of go on and include KC-Y in this competition, since it's been so long and it's going to cost a lot of money? 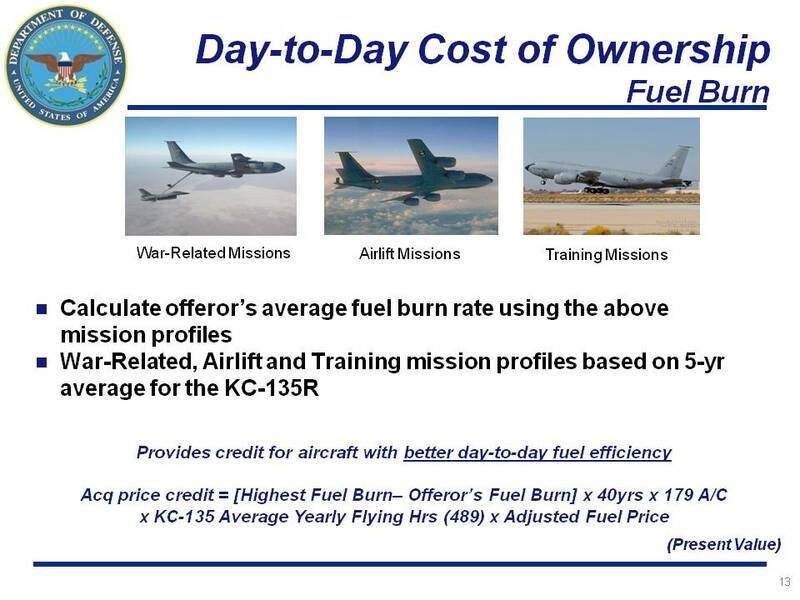 And the cost is going up to keep the KC-135s going. SEC. DONLEY: Well, this procurement will go probably in excess of 15 years. So the strategy of doing KC-X, Y and Z still seems prudent. Doing a buy of 179 aircraft will take some time. And we will want to re-evaluate at the end, about 15 years out or so, how we want to approach a KC-Y. How do we approach the next increment of tanker recapitalization? Q When you reduced the requirements from 800 to 373, was that an administrative exercise, or did you actually have to go back to the operators and tell them to give up a whole bunch of bells and whistles that they wanted? SEC. DONLEY: We didn't tell them to give up bells and whistles. We told them and they understood from the results of the last solicitation that we had -- that 808 was a big number, that the trade space was a little hard to manage because we had a smaller number of mandatories. And it was really the warfighting community and Air Mobility Command that took it upon themselves to go through and scrub those retirement -- requirements, to take out the duplication, to combine them when they thought that was prudent, to make them more clear, to rewrite them. But the overall requirements at the CDD level did not change, and they still knew -- know what kind of a tanker they want, what characteristics it needs to have. They were able to summarize that in 373 mandatories. Q So there were some major compromises made by the operators compared to the previous RFP to this RFP? Q Mr. Secretary, can you step to the microphone when -- thank you. MR. LYNN: As you said, the underlying, the CDD, remained the same. So it was the -- how we interpreted it. The bigger change, I think, was less the numbers and more the distribution between mandatory and the above threshold, and we've come to the conclusion that it was a better approach to take a path where we made many more of the requirements, the ones we really thought we would need on day one, not tradable but mandatory. And so that, I think, was the bigger change. The numbers had more to do with combinations, eliminating duplication, rather than fundamentally changing the requirements. Q (Name off mike), Aviation Week. When you take the mandatory and non-mandatory that -- the mandatory -- there's no credit for exceeding the requirements. Q Do any of the non-mandatory -- are they effectively objective to the thresholds? 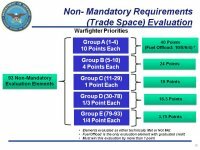 Are you -- do you have a threshold in the mandatory but in the non-mandatory you become -- is an extension of that requirement into an objectives phase -- you know, cargo capacity -- do you have a threshold that's in the mandatory and then an objective that's in the non-mandatory, or are they very separate, the non-mandatory requirements? MR. CARTER: Some of them -- most of them do not have the character that you've just described. Some of them could be interpreted in that way. For example, aerial refueling: There is in the -- there is a threshold aerial refueling capacity, and then in the trade space, the -- one can get additional points for additional. But for the most part, they are simply extra features that the customer was willing to pay something for, but not a great deal for. Q And is there a cap of 1 percent? You said it's -- the way it's expressed is that the non-mandatory, you're willing to pay up to 1 percent of the assessed price. MR. CARTER: That's exactly right. That's what the 1-percent gate -- that's where the 1-percent gate comes from, from the customer's judgment that in aggregate those 93 extras, which he doesn't require but would add value, are worth something to him in -- but not much more than a percent of the overall price. Q My first question is about the potential value of this award. The last one was said by the Air Force to be worth perhaps $35 billion by the time the 179 aircraft were acquired. Is that the same figure that applies now? MR. DONLEY: Approximately the same, yes. MR. CARTER (? ): Though we'd like to pay as little as possible. Q (Chuckles.) Right. You say that this strategy avoids much of the subjectivity which you, in retrospect, found had entered into the last choice, along with the GAO determination. Q What subjectivity, in fact, are you thinking of? What was rated subjectively rather than very objectively in the past competition? MR. CARTER: The offerers represented to the GAO that they were not able in all cases to ascertain whether one element of the trade space was more important than another element of the trade space or not. And therefore, they weren't able to allocate their effort as an offerer precisely. That's what I mean by subjectivity. In this case, the offerers will know exactly what it takes to win, because they're going to be able to go into IFARA, that model will be available to them. They can do all the math themselves. They could look at the 93 tradable elements. We've shown them what they're all worth. And they can figure out how to win. And that last time, there was some ambiguity in their minds about what it took to win. We've tried to remove as much of that as we can. MR. CARTER: It is. It is the same model. It is updated in some respects, because war plans change, and the IFARA model is based on real war plans. But in its essence, it is the same model. A number of adjustments have been made just to improve it. None of this will be mysterious to the offerers. They'll have complete access to it. They can see it; they can play with it; and they can play their airplanes against it. Q How much weight will be given to cargo and passenger capacity? MR. CARTER: Cargo and passenger capacity is one of the elements -- it appears both in the mandatory and the nonmandatory requirements. And as you -- when you get the RFP, you'll see precisely how that works. Q And how exactly is the Northrop information that was disclosed in the debrief last time -- how was that exactly not germane this time around? MR. LYNN: It's different competition requirements. We've made many more requirements mandatory. The offerings are going to have to be different to meet those mandatory requirements. MR. CARTER: It's not a rerun. Q (Off mike) -- price register. In devising this new draft RFP, to what extent were you influenced by the objections raised not only by the offerers last time around, but also by members of Congress, for example, regarding MILCON costs, fuel burn, et cetera? MR. LYNN: It'd be hard to say the -- I mean, we obviously reacted to the GAO report, and it overturned the competition. Beyond that, we just did a general review that we tried to improve the RFP and the source-selection process along the lines Ash described in terms of being more concrete about what the criteria were, how we were going to measure, how we were going to score; and so that the offerers are going to be able to follow that decision tree, as said, and understand exactly what we're doing. The sources of criticism came from many different places. We didn't react to one or another with any particular emphasis. Q August Cole with The Wall Street Journal. The cycle here we have from the RFP -- coming from the RFP tomorrow to the award -- at what point in that is there the greatest risk of a protest, do you think? MR. LYNN: Well, of course, we're hoping there's no protest. And we don't really control that. I don't -- I mean, normally protests come after an award's been made, but I don't really have any way to project it. As I said in answer to the last question, we've tried to make things so concrete that the scores and the judgments are going to be transparent; that they'll be no basis on which to make a protest. But we don't control that. Q (Inaudible name), of Bloomberg News. Now, this a draft proposal, and so it's open to discussion between the Pentagon and the offerers and some members of Congress, as you indicated. I was wanting to see if you could talk a little bit about what are some of the areas that are open to discussion in this draft. MR. LYNN: Well, I mean, I don't think anything is closed. But I mean, we have walked around this a lot. We've been very careful about how we put this together. And so we think we have a solid product. But we're going to take the comments, as you said, both from the offerer. And the secretary made clear that the comments from Congress were what we were very much interested in as well. We haven't identified areas that we want comments and areas that we don't. Q If I may, I have a follow-up. There were some members of Congress this morning who were quite insistent that they wanted the Pentagon to take into account the WTO decision from earlier this month. Is that something that the Pentagon has closed the door on, or is that, again, something for discussion? MR. LYNN: Well, as I said in answer to some earlier question, the WTO ruling is an interim ruling. It is a ruling on one of two complaints. And the two complaints are from both, each side. We need -- you need to pursue that process to a conclusion. That's going to require a final ruling in each case. It's going to require completion of the appeals. That process is going to take several years. So it -- beyond the step that we've taken, which is to hold the taxpayer harmless to any penalties that would result from this process, that would be themselves worked through the WTO process, that's how we're approaching it in the draft RFP. Q Would it be fair to say that the WTO issue is -- the decision on that is taken and it's not open to discussion or debate? MR. LYNN: We've taken -- we've, I think, described in detail -- I just described in detail what our thinking is on the WTO process. Q Secretary, on the IFARA, you mentioned that the bidders will, you know, be able to look at the model. Will they know the specific scenarios that their planes are competing in? MR. CARTER: Yes, they will. These will be classified. But there will be -- they will -- so these will not be public because these are our war plans. But they are real TPFDDs, that is, real deployment plans, real air tasking orders, that is real elements of real war plans, real homeland security plans. So they are classified. But the offerers will have access to that information. Q Do you think they'll come back at some point and say, well, we think this scenario doesn't favor us, because of whatever reason, and therefore you guys are subjective, and we lost on that point. MR. CARTER: Well, the scenarios are what they are. The world is what it is. It's fair to come back with some detail of how the model works and so forth. And we can always consider something like that. It's unlikely that we can reconsider our war plans or the threats we face on the basis of a tanker competition. Q On the basing credit, on MILCON, you know, whatever bases are chosen, will they know what bases are chosen? MR. CARTER: I'm going to let Secretary Donley here. SEC. 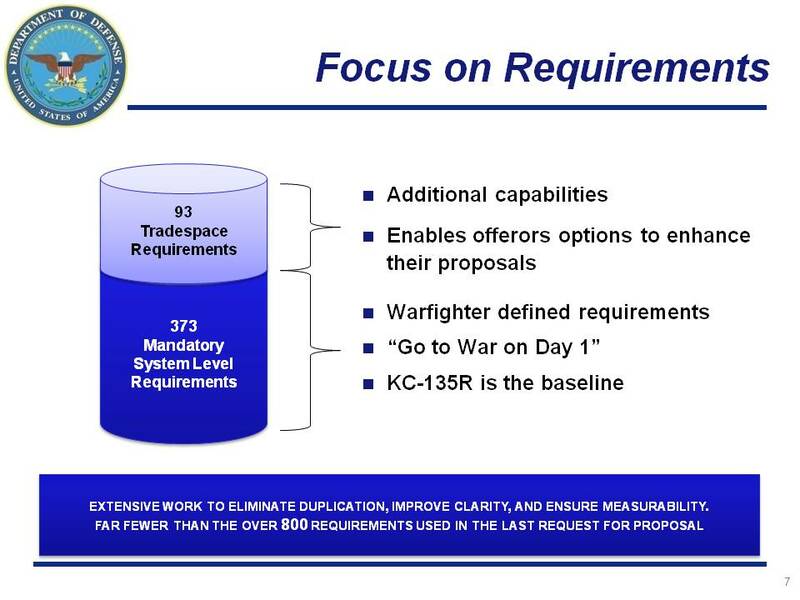 DONLEY: Yes, those bases are identified in the RFP, and they're representative of -- they're existing tanker bases, CONUS, overseas, active, Guard and Reserve: a representative mix of current tanker bases. 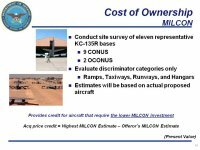 Q Can I just ask, on the MILCON costs, are those costs -- they'll be calculated by the Pentagon and, in fact, have been? Q The fuel burn will be supplied by the offerer, but the MILCON costs will be assessed by the Pentagon? MR. LYNN: You've got that right, except the fuel burn will be validated by the Pentagon. Q And MILCON refers to what exactly? Q But specifically, that's hangars? SEC. DONLEY: Ramps, runways, hangars. MR. CARTER: Hangars, ramps, taxiways, runways. Q The 14 independent review panels, is that unusual for a DOD major program to have that many panels? Is that standard procedure? SEC. 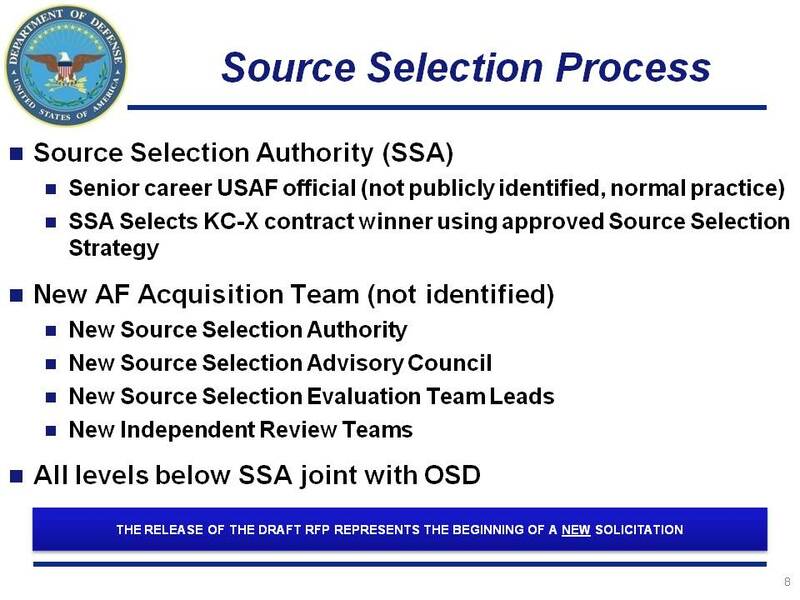 DONLEY: This -- just to clarify, the 14 I was referring to, that -- those are the source-selection evaluation teams. Those are the working-level -- those are the working-level teams that evaluate the proposals. So they will take the -- various parts of the proposals will go to a -- one part will go to a particular team, they'll do the evaluation. That number is not unusual for a program of this size. MR. LYNN: These are inputs. SEC. 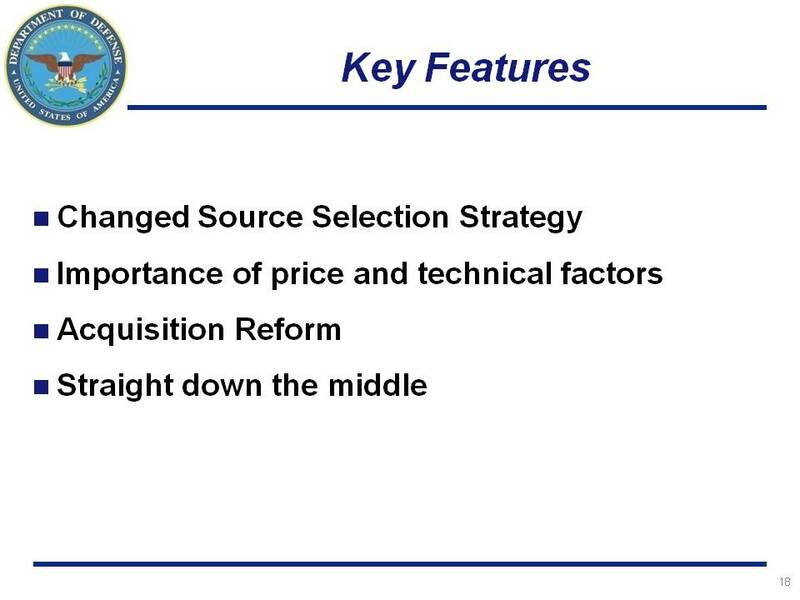 DONLEY: These are inputs to the source-selection process. They're the working-level team reports on how well the offerers did in their proposals against the requirements laid out in the RFP. That's what the evaluation team does. They provide that information up to the source-selection advisory council, which is a more senior council that pulls all that together, reviews it and assesses it. Q (Off mike) -- panels, can they overrule the decisions? SEC. DONLEY: The independent review teams do not have source- selection authority. They are inputs to the source-selection authority. MR. LYNN: It doesn't work that way. It's -- what they're doing is to make sure that the work is being done correctly, the calculations are being done correctly, that the documentation is -- is all complete. So, you know, if you find the documentation isn't complete, is that a stop? No, I mean, you tell people, "You need to -- you need to document this." And this is, as I say, partly in response to the GAO, and partly just to try and up our game, is that you need to go through these steps. This is -- this is a lot of money. This is a lot of jobs. We're taking this very seriously, and we want to make sure that we get it right. And those independent review teams are about getting it right. SEC. DONLEY: I'd like to make another point that perhaps I didn't make as clearly as I should have in the brief. The source selection authority is a senior career Air Force official. And those advisory council, the evaluation teams underneath, support the decision that needs to be made by that source selection authority. But below the source selection authority, the advisory council, the teams, are made up of Air Force, Navy, OSD -- these are sort of our best players, and represents the department's expertise being brought together for this work. So this is collaborative, joint work across the department, to make this a successful award. 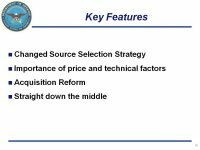 Q This model, applied to future major acquisitions, is this -- you say that it's consistent with the department's acquisition reform goals. But are you looking at a structure like this for major competitions going forward? MR. LYNN: I think there are two aspects to that. Let me break it down. In terms of trying to move the needle more towards the fixed-price development world, when it's appropriate -- and that's an important caveat, because you need to make sure that the risk is bounded -- but when we have the technology in hand the way we do here, when we think the technical risk is lower, when we have the commercial base that we do and we have the full understanding of the requirements we think we have, we're going to try and pursue that type of contracting. So that's one piece. Whether the structure -- this may be more to your question -- whether the structure that we've put together here in that decision tree we'll pursue is still -- pursue in further acquisitions, is an open question. We've worked hard at this, but we've been focused on this one. We haven't quite lifted ourselves to see, okay, is this a model we think we ought to apply? But it's a good question, and we will be looking at that. Q But then in other words, you're going to these great lengths because of an overwhelming desire to -- to do what? MR. CARTER: Well, we are going great -- to great lengths to be clear about how we're going to pick the winner in this competition. You ask how extensible is that method to other -- the deputy has already indicated that the fixed price aspect is something that we definitely -- and that you will see us doing in other competition. 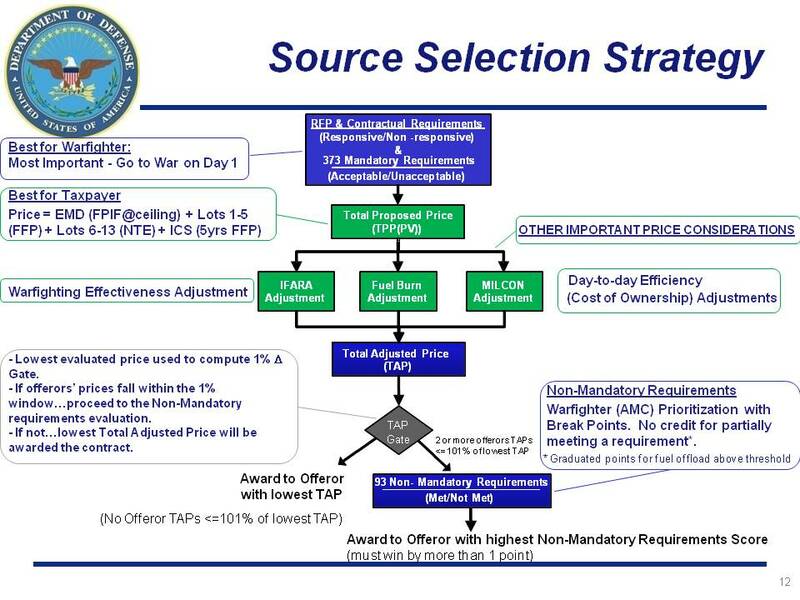 However, not -- if this -- this kind of methodology isn't appropriate to all Defense programs. This is a program where the product is relatively well-defined. It is a derivative of a commercial product in widespread use. And that's why we can very crisply define what it -- we've had them for many years. We know them. The customer knows what he wants. That won't always be true. And so it won't be possible for us to do this for all products. So it's not just because it's the tanker -- and the tanker's very important -- it's because it's a tanker, which is a well-defined product that we're able to do this. 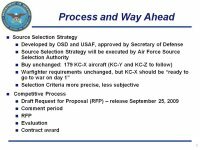 The second -- there is another respect in which we are -- and Secretary Gates has made us not go to great lengths, and that is the method that Secretary Donley described by which the Air Force will exercise the source selection authority is the normal method. That's why I so strongly recommended and Secretary Lynn so strongly recommended to Secretary Gates that he restore that to the Air Force. That's where it belongs. What -- our job is to do what we've described to you today, which is to craft and explain this acquisition strategy. It's not appropriate for me in the Pentagon to be the source selection authority, in my judgment. That is something that a professional career Air Force official, as Secretary Donley, should do. And in that respect, it's not -- we -- I did not think it was appropriate, and the deputy and the secretary agreed to make a special case, process-wise, of the tanker, just because it was the tanker. In that sense, we're doing it just the normal way. So those are two aspects to your question. Q It's August with The Wall Street Journal again. Given that Boeing and Northrop both have new defense -- a new defense CEO at Boeing and a new CEO coming at Northrop, they fought awfully hard last time. Are you going to try to set any boundaries or limits of decorum if you will here, about how far they can go in trying to win this? MR. LYNN: Well, I think it was up on one of the charts. The secretary was pretty clear that he would like this to be a civil competition, civil debate. He mentioned corporate food fights. So I don't know how much control we have, but we would very much like this to be done in a professional, objective manner. SEC. DONLEY: And I would add that the deputy, Secretary Carter and myself, we have made this point to both of the offerers, the likely offerers. We've made this point to members of Congress as well. MR. WHITMAN: We'll take maybe one or two more. And then we'll have to close. MR. LYNN: Have we missed anybody? If everybody has gotten one, sure, go ahead. Q George Talbot again, Mobile Press-Register. Apart from senior leadership, which as I understand has pretty much turned over, the people below that level, the folks in the trenches, are they -- are they generally the same people who were involved in last year's competition? SEC. DONLEY: There are some people on the evaluation teams who are just the experts in the Air Force. So yes, there are some members at the evaluation team that are the same. But the leadership has all changed. Most of the players have changed. But there are some experts that are still the experts. And they will be going forward. Q How many people are involved in this decision, in this whole procurement, would you say? SEC. DONLEY: Don't think we've counted that up. But we can -- I'm sure we can come up with a number. I would just like to emphasize though again that this process of -- normal procurement processes, there is a source selection advisory committee. 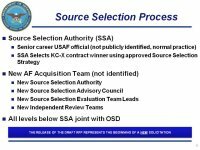 There are source selection evaluation teams. And we've added or are starting to add, with more regularity, the independent review teams. But this basic process, as Secretary Carter noted, is the same. Q If Congress directs that you make a dual buy, do you have a plan B? And if not, how long would that take that kind of acquisition to develop? MR. LYNN: I -- I think we're through that debate. Congress has not directed that we make a dual-buy. The legislation gives us a choice between the path that we followed or a dual-buy, and we are proposing that we will make a single award at the end of this competition. The RFP allows us to make a dual-buy, and the RFP allows us to make no award. But our plan is to make a single award. And I think Congress has really already spoken on that at this point. MR. WHITMAN: Perhaps, one more. Q Can I just check? In the previous competition, there was an adjustment made for risk, an assessment of risk in the proposal. Is that still in the process somewhere? MR. LYNN: Yes, it is. It's in that upper box. Q The very top box? MR. LYNN: The very top box. These are the normal contractual aspects of proposal risk. And they will be assessed -- again, on an acceptable, non-acceptable basis, in a specified way.